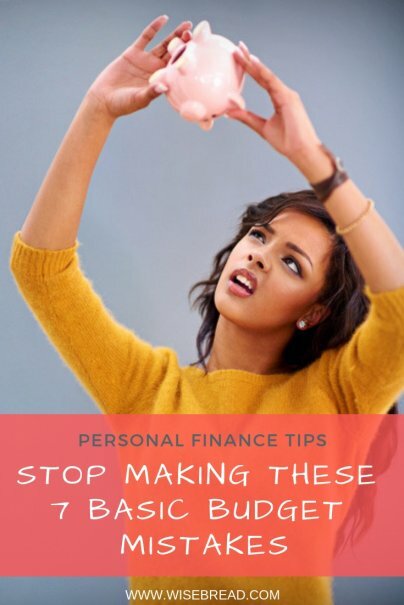 Budgets are the foundation of frugal living and personal financial success. Clear and realistic budgets help us better understand our financial picture, rein in irresponsible spending, and develop stronger saving habits. If you're having a tough time sticking to your budget, maybe it's not your willpower that's broken — maybe it's your budget. Here are seven important budget mistakes you may be making. Saving for the future? If it's not part of your budget, it's probably not happening. Make sure that your monthly budget includes a healthy contribution to a money market account, IRA, or 401K plan. It's one the few expenses that will actually pay you back in the long-term. Emergencies happen. Cars break down, pipes burst, and appliances bite the dust. If your budget doesn't include a savings plan or emergency fund, it doesn't reflect the realities of life. Avoid blowing your budget or relying on high-interest credit cards when the inevitable happens — make sure your budget has a line item for what-if's and oh-no's. Most importantly, avoid the temptation to consider this part of your budget negotiable. Often, budgeters will simply pull from the savings column to inflate discretionary spending. As you can imagine, this approach is a slippery slope that can quickly wipe out the best intentions. Budgets are for major — and minor — expenses. If you ignore the $4 coffees, the $12 movie tickets, and the lunches out twice a week, your budget will quickly become more abstract than exact. Monitor and account for each expenditure to get a clear idea of what you're spending and where adjustments need to be made. While budgets are designed to impose limits on spending, they should still offer some degree of flexibility. Certain expenses fluctuate around the holidays, during major life events like weddings and graduations, and even in response to changing weather. If your budget doesn't allow for a little bit of responsible wiggle room, it won't be useful and you'll soon abandon it. Remember, your budget is your creation. It should respond to the needs of your life and be able to bend without breaking.